Everyone was so nice and helpful! Therapy is great and got me back in shape to go home with my wife. 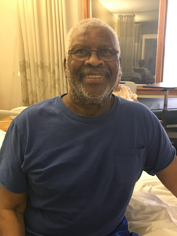 Mr. Albert Cross was admitted to Signature HealthCARE at Summerfield Rehab & Wellness Center after undergoing a total knee replacement. Thank you for choosing the team at Signature HealthCARE at Summerfield! It was our pleasure to be part of your journey back home.